Rock Falls, IL, March 22, 2011 – A new mobile lubrication system from the fluid storage and handling specialists, The IFH Group, provides storage and dispensing of lubricants, cutting oils, bearing oils, hydraulic fluids, transmission fluids and engine oils for plants requiring lubrication maintenance at multiple locations over a large area. The new system is delivered on a pallet that allows it to be placed by a forklift in the bed of a heavy-duty pickup truck for go-anywhere mobility anywhere within the plant. It includes two 50-gallon and two 25-gallon steel containers with PVC sight gauges. Air-operated piston pumps on top of each container provide a 5:1 pumping ratio while filters on the side of each container remove any dirt or small particulates. A ball valve manifold attached to the compressor in the center of the system allows users to turn on one, two or all four of the pumps at any given time. 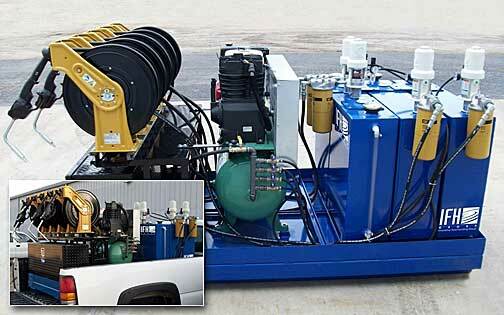 Startup is quick and easy with the system’s on-board gas-operated air compressor. At the dispensing end, the system provides retractable hose reels with metered dispensing control handles to show how much fluid has been dispensed. A large steel tool box with cabinets is placed underneath the reels for convenient storage of tools, greases, rags and whatever else is needed out in the plant. truck bed for go-anywhere mobility within large plants.